This mare is going to win some serious money in Futurity Alumni Program this year! 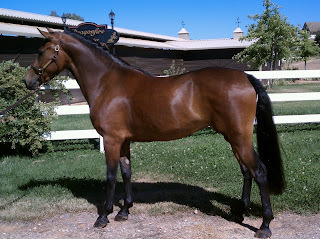 As a coming four year old, "Jolie" has the makings of a top class Sport Horse, with talent for both Dressage and Jumping. She is by the incomparable Sport Stallion, Dragonfire Kirin and out UVM Columbine, a World Champion herself in Hunter Pleasure. Sweet, willing, and down to business, Jolie captures that real Morgan essence of heart and beauty all wrapped up in a darling able body. She made her show ring debut last year at the Motherlode Morgan Show and was crowned the Grand Champion Sport Horse Mare In Hand. She is wonderful to handle and loves any job you throw at her. Sensible on her hacks out, we just know she will be a star across country as well.